These are my comments and thoughts on issues associated with our collective journey towards a sustainable future. The Baillieu government has also announced an intention to change the Flora and Fauna Guarantee Act to that a bureaucrat can exempt VicForests from complying with it, thereby allowing them to log forests that are and should be protected. 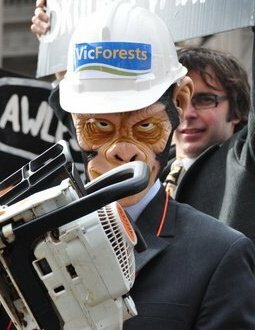 There is a whiff of cronyism and corruption about VicForests too. Graeme Stoney, Premier Ted Baillieu's brother in law, has been recently appointed to the VicForests board by the government. Stoney has also recently been active behind the scenes coordinating the return of cattle to graze in the Alpine National Park under the bogus pretext of "research into the role of cattle in bushfire mitigation". In addition, the wholesale conversion of native forests into plantations by continued logging and burning is simply not sustainable, as scientists such as Professor David Lindenmeyer have stated. I suppose the old argument arises again, and that is. Is it not better to obtain our hardwood requirement from Australian controlled logging, than to import hardwood from uncontrolled Sth America, New Guinea, Malaysia, etc. sources. Remember that Hardwood Plantations take 10+ years to reach a usable size. In my view, it is better to harvest our hardwood, than to ship hardwood from uncontrolled harvesting countries, at least for the term till we are able to use our own hardwood plantation timber, and the quantities of Australian plantation hardwood reach the required levels. Grant, did you know that about 2% of our logged native forest ends up as appearance grade wood, about 18% is used for low value uses such as roof battens and pallets, and the remaining 80% is woodchips, most of which are exported? We can shift our entire wood and woodchip production to plantations right now. We can also choose as consumers to avoid products that come from the destruction of our native products. We should also restrict timber an wood product imports for unsustainable logging elsewhere in the world. Of course, many people don't realise that their Merbau decking comes from the destruction of Asian primary rainforests.